Chaos at Council -- Who's Responsible? Remember it could have been your son, your grandson. Lets show support for Trayvon and his family..
Join us in a peaceful march to City Hall to show our support. For more information Call Eleanor Thompson @ (510) 837-0188. This photo is from a flash demonstration on March 28. Let's show the youth that this whole community is behind them. Who is responsible for the chaos and disruption of City Council meetings? The City Council Meetings have become unbearable. The reason, I contend, is that Corky Booze is purposely trying to promote chaos in order to promote himself by tearing down other council members and community leaders moving Richmond in a progressive direction. The responsibility for trying to keep order at Council Meetings belongs to the Mayor. She has to enforce the rules. But when a Councilman continually disrespects her as the Chairperson of the meeting, interrupts her, uses his loud voice to bully her and the city staff, it is a very difficult job. And when he encourages the people who attend the Council Meeting to disrespect the Chair and everyone else on the Council, the meetings get downright nasty. This clip from last Tuesday's meeting is just a sample. Because of the way the audio is recorded, it is hard to hear audience comments yelled out. But there is no mistaking the disrespect conveyed by Booze. If Booze is the main problem, the fact that other Council members, particularly Bates and Rogers, encourage Booze's behavior by supporting it with words or inaction makes it much worse. a)... No Councilmember shall by conversation or otherwise delay or interrupt the proceedings or the peace of the City Council, disturb any Councilmember while speaking, or refuse to obey the Mayor [in conducting the meeting, unless overturned by majority vote as specified by procedures in the rules]. ... any person who interrupts the proceedings of the Council who refuses to maintain silence or take a seat when ordered to do so by the Mayor, or any person who by any other action willfully disturbs or disrupts the proceedings shall, upon order of the Mayor, be removed from the Council chamber by any police officer present. The views here are the author's and not necessarily those of the RPA. Organic vegetables don't have to be expensive. If you're not able to grow your own, try going to your local community garden! Richmond High School's urban ag class grows an abundance of beautiful organic vegetables in their school garden, and they have an abundance to offer to the community at $1/pound. Past and current offerings have included: Spinach, Swiss Chard, Kale, Beets, Leeks, Green Garlic, Snow Peas, Spring Onions, Carrots, Radishes and Cilantro. I've tried all of these and they are indeed delicious!! Contact Adam Boisvert at UrbanTilth (510-323-5347, adam@urbantilth.org) to be added to the e-mail list and receive updates whenever a new crop is available. Pick up times are generally Friday between 3:15- 4:00pm and Sundays 10:00 am - 12:00 pm, subject to change. Watch the e-mail notices for the up-to-date info. The garden is located near the back gate of Richmond High School at 24th and Maricopa Streets behind the portables. Enjoy--low cost, healthy, tasty and grown right here in Richmond. Plus, you're supporting local students who are learning how we can grow our own food in a healthy and sustainable way! As noted in the film "Heist: Who Stole the American Dream?" several major financial institutions not only profited immensely from the financial meltdown of 2008, they were also among those responsible for the economic crisis that has caused so many people to lose their homes and their jobs. Do you or anyone you know have an account at a branch of one of the big corporate banks? If so, you might want to consider switching to one of the very attractive and more socially responsible alternatives, such as a smaller local bank (like Mechanics Bank) or a credit union. Travis Credit Union, 3300-A Klose Way (just up the hill from the movie theater at Hilltop). Membership is open to anyone who lives, works or studies anywhere in Contra Costa County (and some other counties, too). The Richmond branch is open weekdays and Saturdays. Contra Costa Federal Credit Union at 25th and Nevin. Membeship is open to public employees (any government agency) and their family members. Open weekdays. Atchison Village Credit Union is a very small credit union for residents of Atchison Village. There are additional credit unions in neighboring cities, such as Patelco Credit Union with branches in Berkeley, Oakland, Concord and more, and Cooperative Center Federal Credit Union in Berkeley. If you've been calling for power to the people, then why not put your money where your mouth is! The Council of Industries and other corporate and developer dominated groups are mobilizing their members to come to the City Council to defeat all of the people-friendly, environment-friendly amendments that have been generated by the REDI Coalition and discussed and submitted by the Planning Commission. Richmond has welcomed the new Lawrence Berkeley National Labs and we still do. That does not mean that we shut our eyes to any problem or endorse every activity that takes place there. One area of work to be concentrated in the new labs is Synthetic Biology - modifying or even creating new life forms. Since much of the labs' work is driven by commercial interests in this new $1.6 billion industry, we have to keep special watch to insure the safety of workers and the surrounding communities as well as the long term impact on our environment and society. Steven Jones wrote a report on a recent conference on these issues in Berkeley for the San Francisco Bay Guardian He included a recent interview with Mayor Gayle McLaughlin which is reprinted here. SFBG: Do you have any concerns about safety at the lab or with the regulation of the synthetic biology field? GM: I understand that this issue is extremely important. I was at the symposium "Unmasking the Synthetic Biology Lab" held in Berkeley last week and have been learning about the risks and concerns related to this field. SFBG: Are you worried that we're entering another "economic bubble," this time with so-called "green jobs," and that it could pop like previous bubbles and end up hurting Richmond? GM: I think that green and sustainable job development will continue, as there is an absolute necessity for our human survival that we create a sustainable planet on which to live and thrive as well as pass along to future generations. SFBG: The activists say the Precautionary Principle should dictate a slower and more careful and regulated approach to developing newly engineered microorganisms, do you share that view? GM: I absolutely agree. There needs to be a slow and deliberate process that fully researches and regulates this new engineering. I believe that science has a responsibility to examine step by step what is in the interest of us all as human beings - what truly advances us and what may cause us more problems. SFBG: While the lab diversifies Richmond's economy, much of this research is funded by and could ultimately by developed by Chevron and other big energy companies. Is that appropriate for research into new energy forms that is sponsored with public money? GM: I agree that the lab diversifies Richmond's economy and I support opportunities it offers our community that come from positive, safe and healthy scientific exploration, education, and job opportunities. The fact that big energy corporations are funding much of the research definitely brings up concerns for me. We need to make sure that science is not conducted with an eye toward profit-making, but rather for the advancement of humanity. We know that our society currently is corporate-run, so we need to continuously raise the issue that true science has an obligation not to the corporations but to the people. This issue is something that should be raised everywhere. The Richmond Council endorsed California Assembly Bill183, which would Ban the Box-- removing questions about a person's criminal history from non-sensitive government job applications. This would help give former convicts a genuine second chance. The vote was unanimous. Councilmember Bates' complaint that the brief discussion was a waste of time and the Council resolution could have been handled as a Consent Calendar item illustrated how rapidly the community has been won to this item. When it first came up at a city level in November, Bates voted against it. The Richmond Progressive Alliance strongly supports AB 1831. The measure would go a long way toward reducing recidivism among the seven million adult Californians with criminal records by removing questions about applicants' criminal history from city and county job applications while, at the same time, permitting background checks as necessary later in the hiring process. As you know, the State of California, in 2010, became the sixth state to remove the conviction history inquiry from initial job applications for state employment while delaying criminal background checks until the later stages of the hiring process. Now we urge you to support AB 1831, which, likewise, would remove the conviction history inquiry from initial city and county job applications and delay a criminal background check until later in the hiring process . The City Council of the City of Richmond, with active support from the Richmond Progressive Alliance, has already adopted a measure to "ban the box" from applications for city employment. This measure allows people with a conviction history to compete fairly for employment without compromising safety and security on the job. We know that the stable employment of eligible people with a conviction history is key to reducing recidivism and increasing public safety. 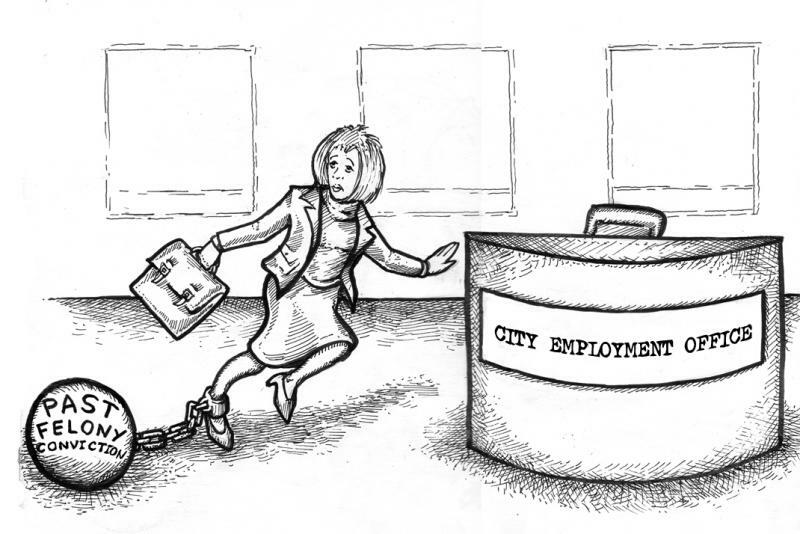 Adoption of AB 1831 - like public employment at the state level - extends the same encouragement to cities and counties across the state and can pave the way for private employers to reduce barriers to employment of people with criminal records. For the above state reasons, the Richmond Progressive Alliance strongly supports AB 1831. This workshop is hosted by the East Bay Community Law Center (EBCLC), the Sustainable Economies Law Center (SELC), and the City of Richmond Worker Cooperative Initiative. The target audience for this workshop is community members (particularly low-income people and people of color) and non-profit organizations interested in incubating worker-owned businesses. 16th and Chanslor on the wonderful Richmond Greenway. at 16th and Chanslor on the wonderful Richmond Greenway. On this day of community action and celebration, we'll be cultivating Urban Tilth's Edible Forest - an "open to all" urban forest and garden that feeds both body and spirit. Following nature's own forestry patterns, together we'll plant 28 fruit trees, hundreds of native under-story plants, and an array of plants in our butterfly garden. Please join us for this important Earth Day Event! Help Make a Difference! In conjunction with the Watershed Project, CFSPM is sponsoring a cleanup at Pt. Molate Beach in celebration of Earth Day. From 10:30AM to 1:30PM on Saturday April 21, 2012, citizens will undertake cleaning up the tide line and man made debris at Pt. Molate Beach. Pt. Molate Beach, located in the middle of the San Pablo peninsula, is a nearly half mile long gentle, sandy beach that at one time was a significant recreational destination and park area. Due to lack of funds to maintain the beach and adjacent park, Pt. Molate Beach was closed to the public in 2004, and has not been maintained since. The beach remains a significant part of the San Pablo peninsula ecosystem. Home to migratory shore birds and extensive eel grass beds, a clean beach will make a healthy environment for local wildlife.